Welcome to Arcadia Hostel | A Greek Inspired Hostel in Medellin, Colombia!! Arcadia is the creation of experienced travellers, who know exactly what backpackers and other holiday makers search for in accommodation. As such, we've made sure to cater to all your needs in terms of various budget options, facilities, location, services and friendliness in a relaxed and inviting atmosphere. Spyros, the founder of Arcadia, was born and raised in Greece but always had a thing for travelling. He arrived in the City of Eternal Spring in 2008, expecting to stay there a mere couple of weeks, a common misjudgement of travellers. Anyone in Medellin will tell you that the safest, trendiest and most exclusive area is El Poblado. We are conveniently located just there, in a peaceful neighbourhood overlooking a tranquil stream. Just a five minute walk and you are in the centre of Zona Rosa, Parque Lleras a buzzing area. Anyone in Medellin will tell you that the safest, trendiest and most exclusive area is El Poblado. We are conveniently located just there, in a peaceful neighbourhood overlooking a tranquil stream…. 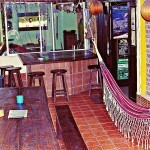 Welcome To Arcadia Hostel - A Greek Inspired Hostel in Medellin, Colombia!! Join us for “Greek Inspired All You Can Eat Barbecue” on Sundays!! We are serving All You Can Eat Greek Style Barbecue every Sunday at 8:30pm until 10:00pm!! Enjoy our DAILY Happy Hour from 7:30 to 9pm!! We celebrate your stay with us DAILY here on Arcadia Happy starting at 7:30PM!